Middle school can be tough. Lucky for Jamie, she has a best friend to help her through. Someone she can trust with her innermost secrets. That someone is her diary. 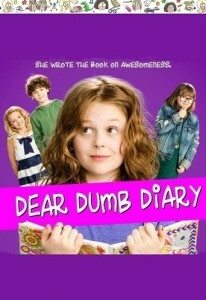 Her Dear Dumb Diary. Tagline: She wrote the book on awesomeness. 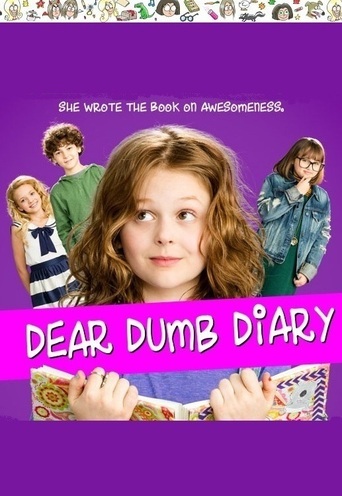 An adaptation of the best-selling books by Jim Benton, Dear Dumb Diary stars Emily Alyn Lind as Jamie, the disgruntled diarist of Mackerel Middle School. One of Jamie’s chief complaints is the effortless beauty of her nemesis, Angeline. How is she supposed to get Hudson, the eighth-cutest boy in school, to notice her when Perfect People like Angeline are strolling the halls? As far as she’s concerned, it’s high time the Average People got their due. When her school’s art program is threatened due to budget cuts, the district decides to hold its first ever Jump-a-thon fundraiser. Jamie sees it as her opportunity to triumph over Angeline and impress Hudson, all while saving the arts on behalf of her fellow Average People. But instead she learns an important lesson about putting her personal feelings aside in order to do the right thing. Once she stops judging people by appearance alone, she also discovers her own sparkling inner beauty, which was there all along.